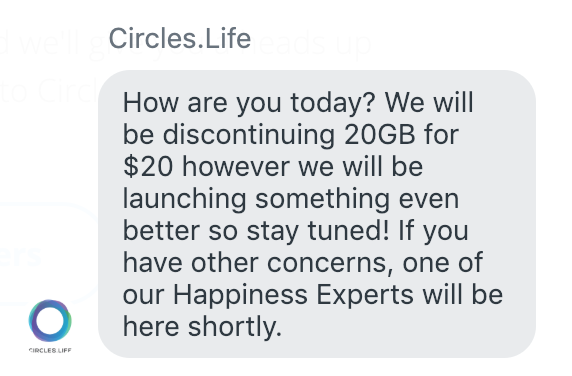 A day after shocking customers with the discontinuation of its 20GB data for $20 option, Circles.Life announces that they’re actually upgrading the popular add-on, to offer unlimited data at the same price of $20 a month. 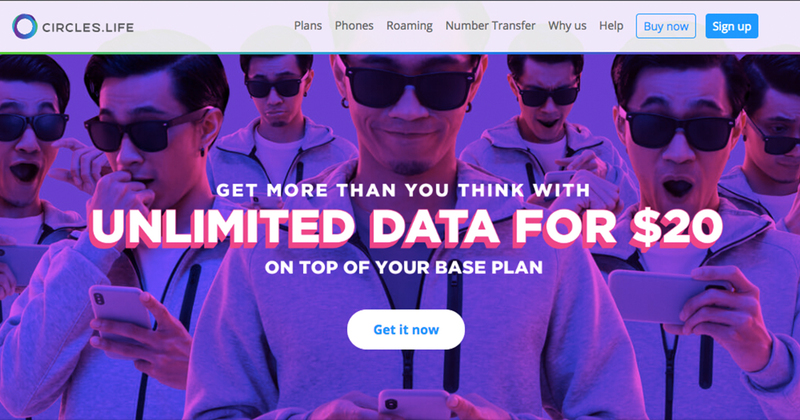 The email also explains that customers who are already subscribed to the 20GB for $20 Data Plus option will be automatically upgraded to receive unlimited data at no extra cost. 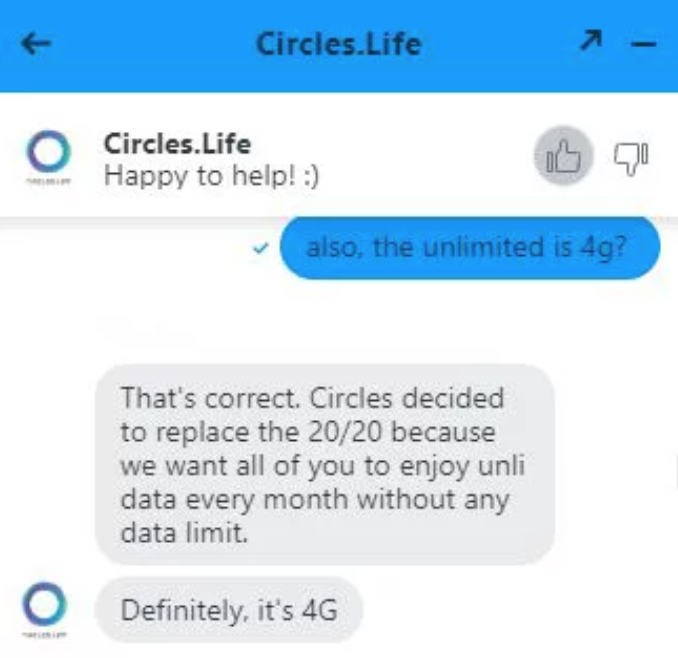 While there was no mention of when the upgrade will take effect, the unlimited data add-on is already available on Circles.Life’s website for users to sign up for now. According to FAQs, data after the first 20GB (on top of the base plan) will be managed to “ensure that [the] network remains great for everyone”, which means the additional data will not run on 4G speeds, but Circles.Life promises users with the add-on will never be cut off their connection. Circles.Life has made waves as Singapore’s first digital telco, which prides itself on fighting data deprivation with its signature 20GB for $20 offering. Targeting consumers who are heavy data users, Circles.Life taps into this market segment and offer what they need most: unlimited data. Since its launch in May 2016, Circles.Life has easily convinced consumers to abandon traditional telco players and get onboard its bandwagon. Rameez Ansar, co-founder of Circles.Life revealed in a Forbes interview that the telco has managed to grab a 3 to 5 per cent share of Singapore’s market in 2018. 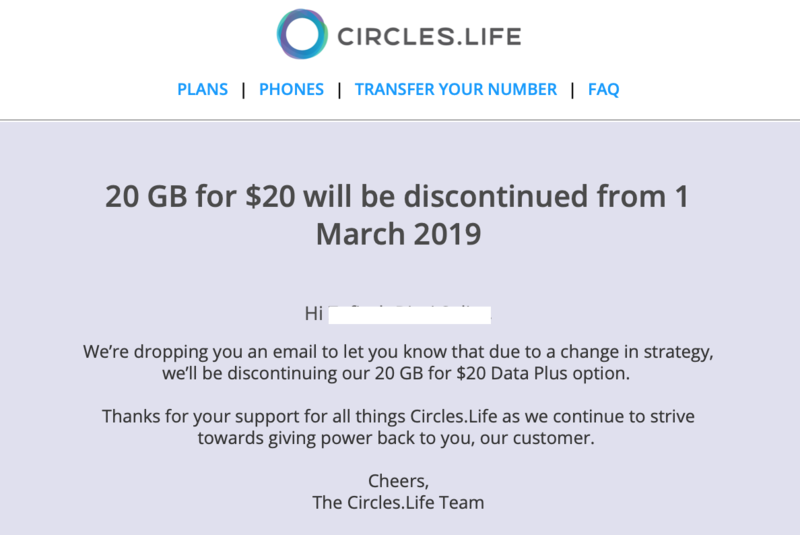 Despite the success of its current strategy, Circles.Life recently announced that it will be changing things up and “discontinuing [their] 20GB for $20 Data Plus option” with effect from 1 March 2019. No further explanation was provided in an email sent to Circles.Life users today except that it was due to a “change in strategy”. Existing Circles.Life users are appalled at this sudden move, and some even said that the telco is “losing its competitiveness” without the 20GB for $20 offering. However, Circles.Life is quick to announce that it is “launching something even better”. The team remain tightlipped about it but said that they will push out an update within the next 1 or 2 days. 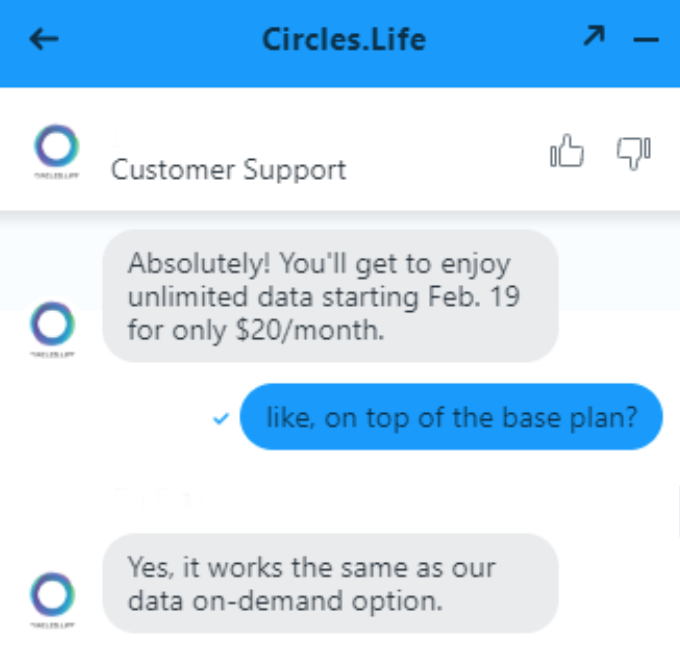 In a separate live chat, Circles.Life revealed to MustShareNews that it is launching a new add-on option featuring unlimited data at 4G speed for $20/month, starting from February 19. 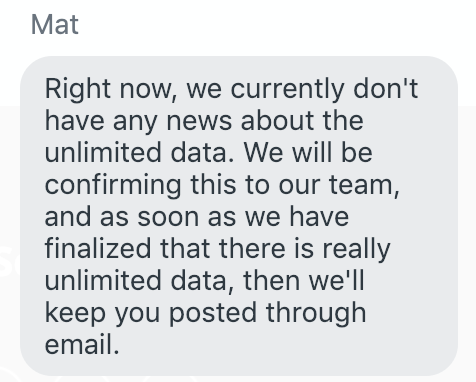 After probing the Circles.Life’s live chat support team on this, they insisted that they “don’t have any news [from their management] about the unlimited data” and cannot confirm this yet. “As soon as we have finalised that there is really unlimited data, then we’ll keep you posted through email,” it added. Meanwhile, Circles.Life is now offering 20GB for $28/month to new users as part of its Chinese New Year promotions, which is limited to the first 2,000 registrants only. In addition, new users also get to enjoy $120 cashback when they transfer their number and $34 off their registration fees.